The featured artist at City Center for the month of March is Susana Millman, a professional photographer and dedicated sangha member. Her show, titled “On the Road . . . to Away-Seeking Mind,” runs for the entire month, with an artist’s reception on Friday, March 6, from 7 to 9 pm. 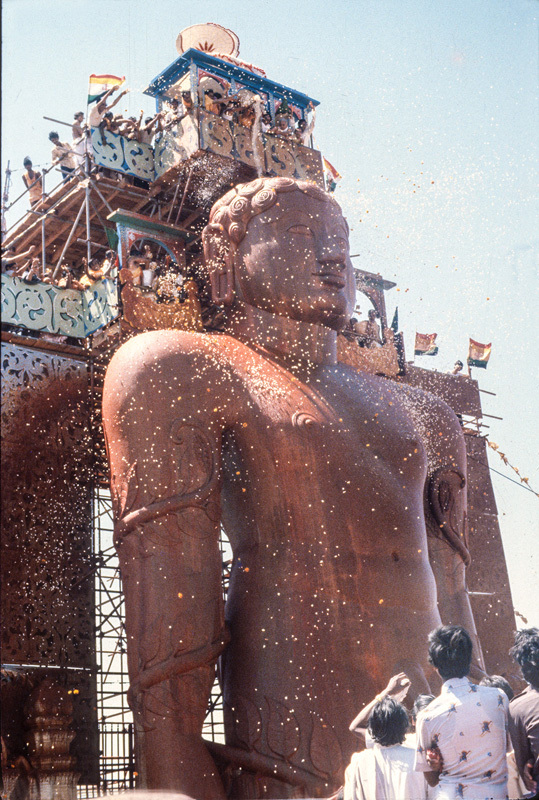 Jain ceremony: “Mahamastabisheka,” the big annointment celebrating the 1000-year anniversary of Bahabali statue, Sravanabelgola, India. Starting in the 1980s, I traveled in Asian countries, including India, Nepal and China, originally with no intention other than adventure and my own cultural development. I found myself repeatedly drawn to remote places of an intensely spiritual nature, where I experienced intricate, monumental works of religious art which had required extreme devotion to build under most challenging circumstances. From these origins, I began to understand that Buddha nature is everywhere, in all of us and in all aspects of our lives, and not just a matter of participation in a specific community institution on a particular day of the week or holiday. I would like to share these remarkable sites in Asia with you through these photographs. Susana Millman left the academic world to pursue a personal interest in ethnobotany and the study of shamanism, and has followed a spiritual path ever since. For some years it aligned with her travels in Asia. She began to study sacred architecture there through the medium of her photography, and eventually her direction manifested itself by bringing her to Zen Center, where she began a formal practice in 2008. She is a student of Shosan Victoria Austin, a member of Saturday Sangha, and a volunteer in the outreach program distributing meals at Richardson House. Her photo show is one aspect of her precept studies. For two other samples of her work, visit her exhibit page on our main website.